Hey there Piano Tiles 2 fans! many users have been writing in and saying that playing Piano Tiles 2 has inspired them to want to take piano lessons. We think that’s great! Unfortunately, it can be hard to know what to look for in a piano teacher, particularly if you don’t have any experience in the area. So with that in mind, we’ve put together this handy guide for how to find a piano teacher in your area. The first step you should take is to go to an online piano teacher directory. We recommend Piano Studio Pro because it has the most easy-to-use framework and it’s incredibly easy to find teachers in your neck of the woods. Once you get on there, all you have to do is type in your zip code or city, and you’ll be directed to listings of the top piano teachers in that area. From there, you can browse what you’re looking for. There are all manner of teachers on there. All you have to do is use the advanced search feature to select the kind of piano lessons you want, and then browse the listings of piano teachers that are available. How much to they expect you to practice every week? What are their qualifications or degrees? Do they have positive reviews from current or former students? Do they specialize in the style you want to learn? We cannot overemphasize the importance of finding a piano teacher who teaches in the style you want to play. A classically trained teacher will be great if you want to play Beethoven and Mozart, but not so much if you’re looking for Jazz or contemporary styles. Having said that, if you’re more interested in just beginning piano in general. A teacher who is classically trained will generally be able to give you a solid technical foundation that will help you branch out into whatever style you want. 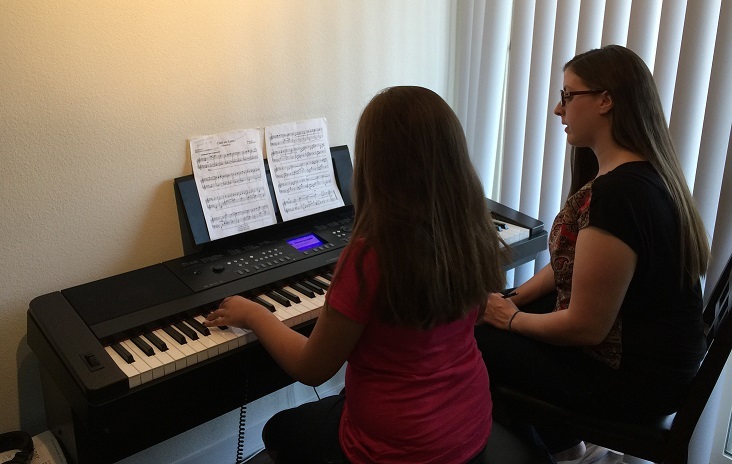 How much do piano lessons actually cost? Rates vary a lot depending on how qualified a teacher is. Again, we would stress that in the case of personalized instruction, cheaper is NOT always better. In fact, the phrase “you get what you pay for” is pretty applicable to piano teachers. If a piano teacher is willing to charge you $8 for an hour lesson… run. That teacher does not know what they are doing, and is not confident enough in their own skills to charge a reasonable amount. Prices may vary based on supply and demand where you live, as well, but as a general ballpark figure, a qualified professional piano teacher will usually charge between $50 and $80 for an hour-long lesson. This may seem like a lot, but again, you can’t put a price on the amount of time and energy you will waste following a bad teacher’s advice. It isn’t necessary to have a state-of-the-art piano or keyboard to start learning piano. All you need is a basic keyboard. If you’re used to playing Piano Tiles, of course, it’s going to be a lot different, so there will be a learning curve, but you should be able to find an affordable instrument by looking for a keyboard online.